As people age, one of the most salient changes is difficulties in memory. 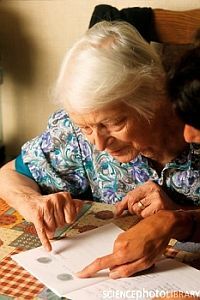 The older people get, the longer it takes for them to commit information to memory or recall it later. This can be anything from a minor inconvenience to a huge challenge that threatens one’s independence. Fortunately, a recent UCLA study has found that a brain training program they developed led to significant improvements in word recognition and recall. The results provide encouraging evidence that the effects of age on memory can be slowed. The experiment consisted of a six-week program, during which residents in senior-living communities participated in twelve separate sessions. This program went beyond what traditional cognitive training programs offer: in addition to memory-training, the program provided education on everyday habits that might affect brain function. The memory training included strategies for memorization as well as training on mental tools that aid memory (such as linking ideas and creating mental images). At the end of the program, the senior citizens who had involved showed improved memory as compared with other residents of the communities who did not participate. The promising results provide hope for treatments of memory-related concerns, and show that it’s never too late to improve your skills and enhance your life. If you are coping with the aging or memory problems of yourself or a loved one, feel free to contact the Bergen County, New Jersey or Manhattan offices of psychologists, psychiatrists, and therapists.